If you’ve ever worked a long, hard day, you know that what you eat can have a direct affect on how you feel and how much energy you have. Food also has this effect on your animals. Working dogs have unique nutritional needs that must be met in order for them to perform at their best. 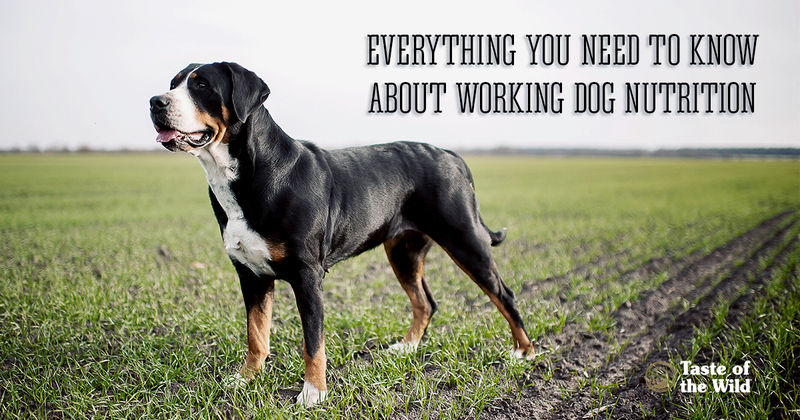 What classifies a working dog? Other breeds may love being working dogs, as well. For example, the Welsh corgi is almost never considered a working dog, but they can thrive when given the task of herding chickens and other barnyard fowl. Is my working dog getting all the nutrients it needs? Just like physical laborers, working dogs get a workout every day. As a result of their active lifestyle, they need more calories to operate at peak performance. Depending on the workload, working dogs need 1.5 to 2.5 times the amount of food as a relatively sedentary dog. Oh, and if the dogs are working in extreme temperatures, the amount of food needed increases even more. A great source of these calories is additional fat. Fat is a long-burning nutritional source to keep your dog moving all day long. Even nonworking dogs and inactive dogs can benefit from a diet high in fats. When it comes to your dog’s food, there are some key things to keep in mind. Dog food must contain specific levels of proteins, carbohydrates, fats, minerals, vitamins and water. The best pet foods have a real animal protein as the first ingredient – such as boar, venison, turkey, whitefish, or another meat, poultry, or fish. All Taste of the Wild formulas have animal protein as the first ingredient and are grain-free. Taste of the Wild formula Pine Forest with Venison & Legumes is a tasty choice for your working dog. With the correct combination of these ingredients, your working dog can lead a healthy, happy life. Consult with your veterinarian about the appropriate amount to feed your working dog. This includes treats and table scraps. While it may be tempting to give your dog frequent treats or rewards, it can cause an imbalance in their diet. Like human treats, dog treats are tasty because they are high in fat or salt, meaning their calories can do harm to your dog’s daily food intake. Feeding your dog directly before or after any strenuous activity can cause digestive problems such as diarrhea or discomfort. Typically, active dogs should be fed an hour or more after their strenuous activity. Sudden or drastic food changes can affect any dog, causing gastrointestinal problems. To avoid this issue, make any changes to your dog’s diet over the span of two to four weeks. This will allow your dog adequate time to adjust to any changes and ensure a healthy digestive system. Ready to try Taste of the Wild for your working dog? Contact us to request a free sample!